Spray foam is an insulation that is an alternative to cellulose, polyester and fiberglass building materials. You can spray the foam onto concrete slabs, roof tiles or into wall cavities. It is not as commonly used as the other building products but just as effective. Its a good product to use in those hard to reach areas where you cant get access with roll form products. What is spray foam made out of? It has a mixture or two components – isocyanate and polyol. These two components mix together and come out the tip of a gun to form the spray foam insulation. The mixture of the two components cause the product to expand and harden. Does spray foam reduce energy consumption? By having this product properly installed you will have a significant reduction on power usage. Up to 40% of a home’s energy is lost through walls, windows and doors. This form of insulation can be used to protect against moisture, therefore reducing the chance of mold and mildew (this is normally a downside to cellulose fiber). By removing the threat of mold growth it would reduce the chances of rotting wood and if you have allergies, reaction’s to mold spores. 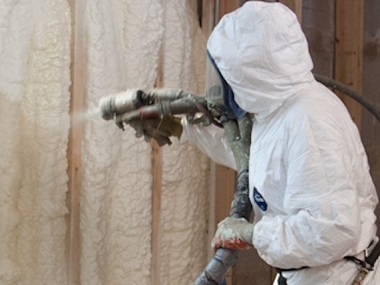 Does spray foam reduce noise levels? Not only does this product have thermal properties and control moisture problems but it works well for soundproofing. Spray foam is like a sound barrier and will reduce sound that travels through your walls, floor and roof. What kinds of spray foam is available? You get two main kinds of foam that can be used to insulate your home or office. The first kind is called “open cell” and the second is called “closed cell”. What is open cell foam? It is a kind of foam that has tiny cell that are not completely closed. You will find that the open cell foam will be the cheaper of the two because less chemicals are used to produce it. The open cell foam is good for soundproofing but you will find it does not provide much assistance with water. It almost has a sponge like look to it. You will normally find it being used in walls around existing insulation. Open cell foam is not for outdoor use. This is a type of foam that is a lot denser than the open cell foam. Its cell structure is much smaller and compact. They are great for sound proofing and for using as water barriers. Closed cell foam can be used outdoors. 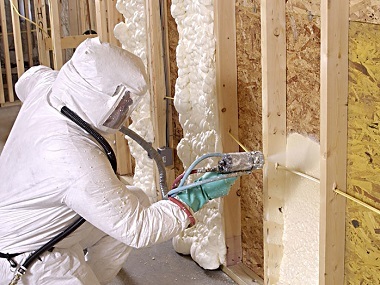 For those who have never heard about spray foam insulation before, you might be surprised to uncover it is among the most broadly used types of insulation in structures today. Spray foam has a variety of uses, with respect to the building’s structure. Mostly it’s employed for warmth and acoustic insulation. It may be installed by professional spray foam companies or it’s easy enough to have the ability to do yourself utilizing a home DIY installation package. Spray foam could be bought online or from local providers. Before you begin your spray foam insulation project, listed here are a couple of fundamental things that you should find useful to understand about the application of spray foam. Spray foam is chemical compound that’s comprised of both organic and non-organic materials. When these materials are combined in a specific temperature, they form a insulation product that grows a great deal bigger than its original size. This is when the compound will get its title. Typically, it will likely be dispersed right into a specific area. Once you have sprayed the foam in the area needing the product, it grows, filling cracks and crevasses and creating an airtight and water-tight seal. An advantage of spray foam is being able to expand and obtain into hard-to-achieve places. This is exactly what makes spray foam this kind of effective insulator. Typically, it takes approximately four hrs to harden and maintains its form and it is highly durable. Spray foam may be used to insulate roofs, walls, flooring, and interior walls. One of the advantages to spray foam is its ability to strengthen and soundproof walls, which makes them stronger. Spray foam likewise helps to safeguard structures from things like mould and moisture build-up like cellulose fiber insulation. Though the years, probably the most common types of insulation was fiberglass. It was usually pink coloured and many people know it as think pink aerolite. The benefit of spray foam insulation is it grows and will get into to any or all the small and difficult-to-achieve places. With many kinds of spray foam, additionally, it forms an airtight and water-tight seal which prevents moisture from leaking in and leading to degeneration from the building structure. Much more importantly spray foam stops the air that leaks through your house. Air gaps can cost you about 40% of your household electricity bills when it comes to heating and cooling systems. Vermin and bugs cannot easily cope with the foam seal therefore it provides added protection for your house.